The haunt, of course, is easy. Cohle lost a young daughter, lost his marriage, and spent years as a deep-cover narco, immersed in the violence of a dark world and only accountable to civilization by the thinnest of threads. He became addicted to alcohol and quaaludes, and after a stint in a mental hospital, he used whatever professional favors remained to take a homicide job in Louisiana, with its cane fields and swamps and oppressive poverty, where one of his first cases involved the ritual drugging and killing of a teenage girl. Life hasn’t been kind to Cohle, and his response to the suffering is to embark on long diatribes about the idiocy of man, and the pointlessness of life. He’s quick to mock those who go about their lives “so certain they were more than a biological puppet.” And he tries to wear this philosophy as armor; the hard-won perspective of a man who lacks the constitution for suicide, but refuses to fool himself with something as embarrassing as hope or joy. This is haunt. But what of the hunger? The brilliance of McConaughey’s performance, over three episodes, is that we’ve gradually come to see the hollow nature of his words. The most misguided (and sadly recurring) critique of True Detective holds that the creators foist Cohle’s nihilism on the viewer. It’s an easy mistake to make, I guess, in conjunction with the show’s ominous tone and the depraved psychology behind the murders, but it’s unfortunate that writer Nic Pizzolato is being punished in some corners for trusting the intelligence of his audience. (And while we’re here, let’s be fair and qualify that complaint; the praise for this show has been almost universal.) Because slowly, subtly, the curtains have been raised. You have to pay attention, but when you do, the truth about Cohle emerges: There’s a spirit underneath the dire pronouncements, something that longs to live and experience happiness, even if the brain regulating the soul with such rigor doesn’t believe in the concept. You see it when he agrees to let Maggie, the wife of his partner Martin Hart, set him up with one of her friends. You see it in the way he knows how to dance, and in his little jokes, and in the bursts of enthusiasm he experiences when he’s on the hunt. You see it in his obsession, and his roiling energy, even years later in the throes of alcohol addiction. The character Rust Cohle may die without ever harnessing the spirit that could free him from the shackles of his pain, but that doesn’t mean the spirit is missing. Even a locked room can hold a beating heart. 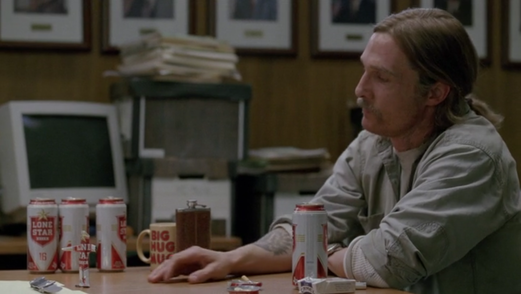 Professionally, though, Hart is starting to understand Cohle. He’s no longer mystified, or secretly impressed, and he’s begun to see through the act; he can spar with him now. “Well, I don’t use ten dollar words as much as you,” he says, after Cohle finishes insulting a group of evangelicals at a tent revival, “but for a guy who sees no point in existence, you sure fret about it an awful lot.” He identifies the panic in his partner, and for the viewer—for me, anyway—this was a dead-on revelation. Cohle, for his stoic demeanor and the absolute confidence of his delivery, is a man in a constant state of turmoil. He talks the talk of someone who has given up on life, but it’s a defensive act, a last grasp for protection, when the staggering and heartbreaking truth is that he wants, deeply, those things that an unlucky fate has denied him. There’s something unquenchable in his heart, and this is his curse; this is why he spends his days trying to convince himself that life is empty. At every moment, there’s something crying out, something that needs to be subdued so he won’t be hurt again. And for Cohle, that thing won’t die. I believe he may be in love with Maggie, who is played by the wonderful Michelle Monaghan in a role that keeps getting better and better. She’s beautiful and wounded, and recognizes two kindred—if differently broken—spirits in her moonlighting husband and the shattered Cohle. When the latter stops by to mow the lawn and drop off the borrowed mower, Hart erupts, because he understands that somehow, this is a violation threatening the remains of his domestic existence. We don’t know for sure, but in the interval between 1995 and 2012, it seems as though Hart has lost Maggie (though not to Cohle), and even though he self-sabotages at every turn, there’s still a recognition inside him of the pain this loss will bring. And Maggie is trying to hold on, trying to salvage something, but can only be disgusted by the change in her husband. There’s a distance, and he won’t confess. In 2012, faced by his interrogators and knowing exactly what they believe, Cohle wants nothing more than to confess—even if the confession isn’t the one they’re after. He’s still panicked about his own fate, despite proclamations in previous episodes that there’s “a kind of victory” in realizing he’s nothing but a drunk. He wants more, and as he frantically carves a metal man from the Lone Star can and talks about how the thousands of dead bodies he’s seen in photographs reveal an acceptance of death in the final moment, the vulnerability resurfaces. “All your life, all your love, all your hate, all your memory, all your pain, it was all the same thing,” he soliloquizes. “It was all the same dream—a dream that you had inside a locked room. A dream about being a person.” I don’t think I’m exaggerating when I say that this moment approaches genius in both the acting and the writing. It fuses the two Cohles, which had previously seemed, in ways, like different men. The elder incarnation was more expressive, perhaps more resigned, but less haunted. We had to wait to learn how they would be reconciled, but the reward is rich. Here, after three hours of television, we see the line connecting them, and how one man spent 17 years changing into the other without changing at all. As for the case, Cohle’s long, insomniac hours come to good use; in the scouring of old crime files, he finds a photo of a drowned girl with stab marks and positive tests for meth and LSD that match their current victim. He and Hart visit the grandfather, and the name of the girl’s boyfriend, Reggie Ledoux, produces the profile of their suspect. When they learn that he was prison roommates with the ex-husband of the new victim, it’s Eureka—they have their man. And for the third straight episode, True Detective excels in delivering an ending that elicits an extreme motion. In this case, horror. “Like a lot of dreams,” Cohle says, his energy fading, “there’s a monster at the end.” As his words trail off, we travel back to ‘95, and our first vision of the man who a young girl in the pilot described as a “green-eared spaghetti monster.” But there’s nothing childlike or imaginative about the vision stalking across a jungle compound, wielding a machete and wearing a gas mask. This is the murderer of at least three girls, and the inspiration for at least one more. This is the holy terror that Cohle still sees when words fail, and the image that tortures him when he closes his eyes. This is the thing he can’t diminish: The apparition of death.